On the evening of that fateful day, March 10 (March 11 in Japan), I was enjoying a barbecue at a friend’s house. Mr. Nakai of Stamina Ramen was there, as well as a mother and her children visiting from Tokyo. We were in the middle of having a really good time. The mother got a sudden phone call from her husband in Tokyo. He was crouched under a desk and said that a massive earthquake had struck, and that the tremors hadn’t yet stopped. In the moment I rushed to turn on the TV, we were soon rendered speechless by what we saw. It was like a scene from a disaster movie. The word “Live” flashed on the right corner of the screen. The silence was broken by the sound of soft sobbing behind me. The younger girls cried while watching the horrific live footage. Our five-year-old daughters see things differently from us adults. They saw familiar-looking towns in Japan which they associated with fun being swallowed by a wave of pitch-black water. We saw footage of people trying escape in cars and on foot. Even after a week had passed, and then a month, I could not get these scenes out of my head. I couldn’t help but worry about the children affected by the disaster. I felt that they could only stop and stare in the cold as they watched people, vehicles, houses, and dead bodies being washed away before their very eyes. My daughters had become distraught just by seeing the live footage on TV. So it was incomprehensible to think what surviving children—who lost family, friends, homes, and everything else they had—were going through. Feelings that I could not even dream to express began to well up inside me. I then thought: My kids and the children of Hawaii could make a connection with surviving children despite the distance between them by showing their support. I came with the idea for “Aloha Snacks.” These would be snacks from Hawaii taped with a photo and a heartfelt message from the kids. The principal at my daughter’s elementary school immediately gave her approval. 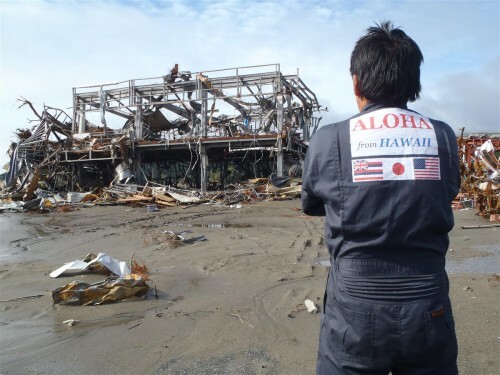 Although my wife severely objected when I told her I was going to the disaster zone, in time she took charge passing out fliers and collecting Aloha Snacks every morning and evening before and after school with other Japanese mothers. Our neighbors and the elementary school principal in the next town started to pitch in as well. Together with the snacks brought by members of the Tenrikyo congregation in Hawaii, we collected a total of roughly 200 kilos or 441 lbs. (roughly 2000 pieces) of snacks. It was a mind-boggling amount, so I contacted Daniel Higaki. With his help we were somehow able to negotiate with Japan Airlines and had them designate the snacks as relief supplies when I took them to Japan. Thank you, thank you, oh thank you, Daniel! 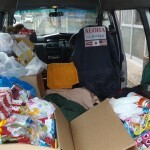 Giving "Aloha Snacks" to the children in a shelter. We had an ample amount of snacks, so I was able to distribute them to kids at roughly 20 evacuation shelters and five or six elementary schools as well as in front of the train station. I’d like to shout out my deepest appreciation to school officials, parents, and the Tenrikyo congregation in Hawaii for your kokua. There were messages written in English as well as freshly learnt Japanese. There were pictures of boys and girls. I am convinced that the kids have kept them as precious mementos. As you may know, the tsunami washed their photos, letters, and everything else away. It’s very likely that the messages you wrote were the first letters the kids got since the disaster struck. Later, when a church minister in Hawaii told me that his niece got an e-mail thanking her for her Aloha Snack, I was so very, very happy. Slides of the pictures I took were shown to all students at the closing ceremony at my daughter’s school. I heard that some teachers watched with tears in their eyes. I believe that the kids must have realized that they truly did something wonderful by donating their Aloha Snacks when they saw those pictures. At the same time, there may have been a few kids who regretted not being able to donate this time. Still, I think this experience will cause them to give when the next opportunity arises. What I am hoping for is that someone will step up and continue what I started. It doesn’t really matter who goes. What matters is that someone goes to spread the message that everyone in Hawaii is thinking of them to as many survivors as they can. It is my deepest hope that the survivors will cheer up, even just a little, when they learn this. It doesn’t matter who you are, stay the course! Go! Go! Stay the course! It’s doesn’t matter what shape or form you do it! Arrived at Narita Airport. I got on a late-night bus in Shinjuku departing for Sendai. It was a bumpy ride on the highway and I couldn’t sleep. Arrived at Sendai Station at 5:00 a.m. My friend in Sendai (whose younger brother is still missing), came to pick me up. 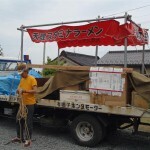 We immediately went to prepare the “Stamen” truck and buy vegetables for the ramen. When we mentioned to the farmers that we were going to use the vegetables to cook ramen for survivors, they refused to take our money. Instead, I ended up bowing my head over and over, saying, “Arigato, arigato.” The Stamen Team arrived that evening and we made finally preparations and huddled for a meeting. 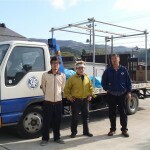 We filled buckets and plastic tanks with water and headed for Ishinomaki City in the early morning. We began in front of the train station where there was still rubble everywhere. We ended up serving more people that we expected and headed to Minamisanriku that evening. 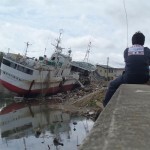 We served ramen in near a park in an area still strewn with rubble until about 10:00 p.m.
Again, we filled our buckets and tanks with water in the early morning and headed to an isolated area beyond Kesennuma City. After this, we went to a junior high school that was being used as an evacuation shelter. We served a total of 2000 bowls of ramen in two days. The Stamen Team left for Tenri early that morning. I loaded a friend’s SUV with a sleeping bag, camping equipment, and a map and headed for Ofunato City in Iwate Prefecture by myself. My Sendai friend told me not to go because it was too dangerous. He told me that there were at least one or two aftershocks a day as well as thieves in the area armed with knives and metal bats. I promised that I would make sure to camp at night in an upland area and he let me go. 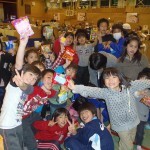 I spent the days until May 16 camping, doing hinokishin, and distributing Aloha Snacks. I left for Tokyo on a late-night bus from Sendai. I then headed to Jiba via bullet train to Kyoto. I arrived in Jiba. I conducted a prayer service in the Main Sanctuary. After exchanging farewells with the Stamen Team, I left for Honolulu on May 18. Kaishow Caravan. Taken May 12, 2011. Here is the reason why I did it. Stamina Ramen opens store in Tenri Hondori!